Microsoft’s sleek, elegant Modern Keyboard looks as good as its feels, with pleasingly clickable keys, a bevy of dedicated Windows keys and an ace up its sleeve: a built-in fingerprint reader. Our only gripes about this rechargeable, Bluetooth-enabled keypad are its lack of programmable keys and its lofty price tag. The Microsoft Modern Keyboard makes a striking first impression with its super-slim profile (just a shade over 19 millimeters) and its small footprint (about 16.6 x 4.4 inches). 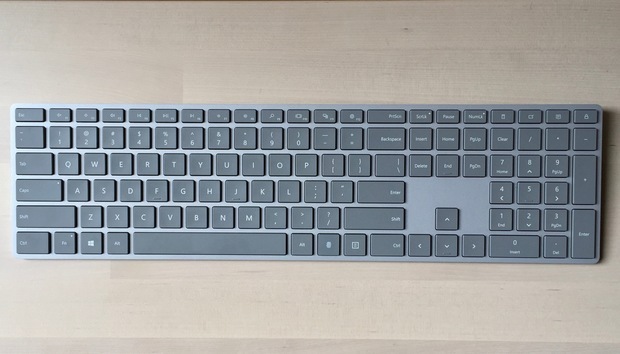 The steel-gray chassis represents quite a departure from those chunky black Microsoft keyboards of old, instead, bearing a striking resemblance to Apple’s Magic Keyboard, right down to its hefty $130 sticker price. 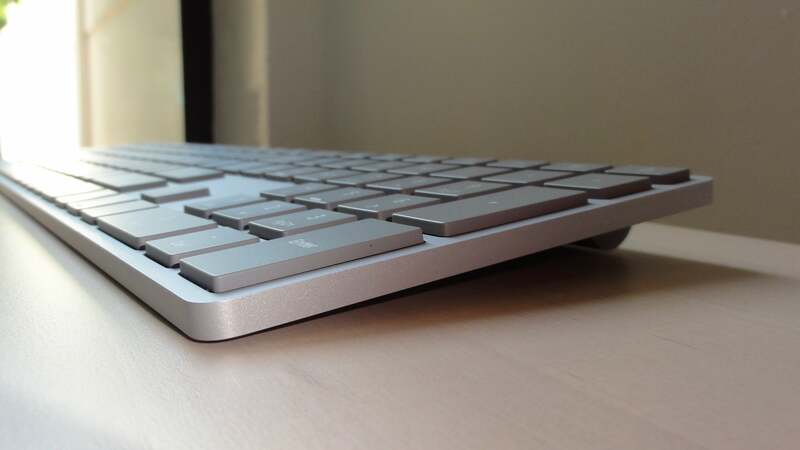 The sleek design of the Microsoft Modern Keyboard makes for quite a departure from Microsoft's prior, chunkier keyboards. Connecting the Modern Keyboard to a Windows 10 machine is a breeze (sorry, Apple users; neither MacOS nor iOS are supported, nor is Android or any earlier Windows versions). Just connect the keyboard with the included USB cable, and Windows will automatically pair the keyboard via Bluetooth. The Modern Keyboard’s Bluetooth connection remained solid throughout my testing, and the keyboard never took more than a second to reconnect after going to sleep following periods of inactivity. The chiclet-style keys on the rechargeable Modern Keyboard (Microsoft promises four months of use between charges) are a pleasure to use, boasting solid travel and a nice, satisfying click when struck. Despite the keyboard’s relatively small size, the keys themselves are comfortably spaced apart, and I rarely hit the wrong key while touch-typing. The Microsoft Modern Keyboard boasts a series of dedicated Windows keys (such as for search, settings and virtual desktops), but no programmable keys. 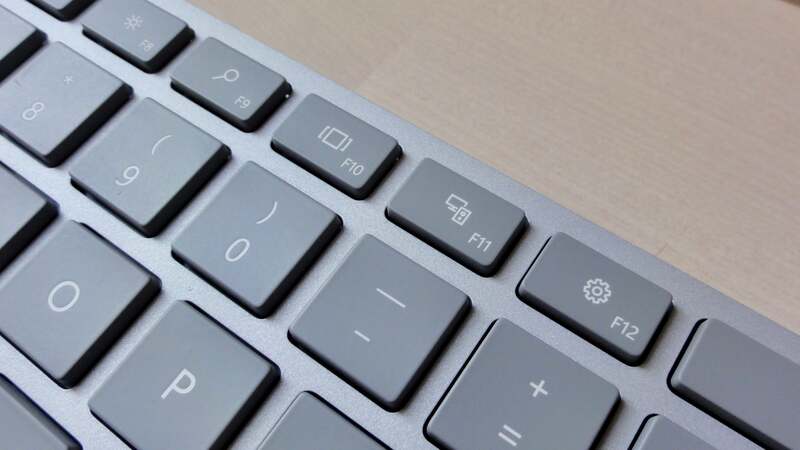 The keyboard comes with a series of handy Windows hotkeys for the Windows 10 Settings screen, Search, the Windows 10 Calculator app, the Action Center, and a key that activates Windows 10’s Virtual Desktops feature. One dedicated key that could potentially trip up some numeric keypad users is the too-easy-to-tap Screen Lock key, which sits just above the minus key on the top-right corner of the keyboard. And while we’re pleased by the impressive selection of dedicated Windows keys, the lack of programmable keys comes as a disappointment. 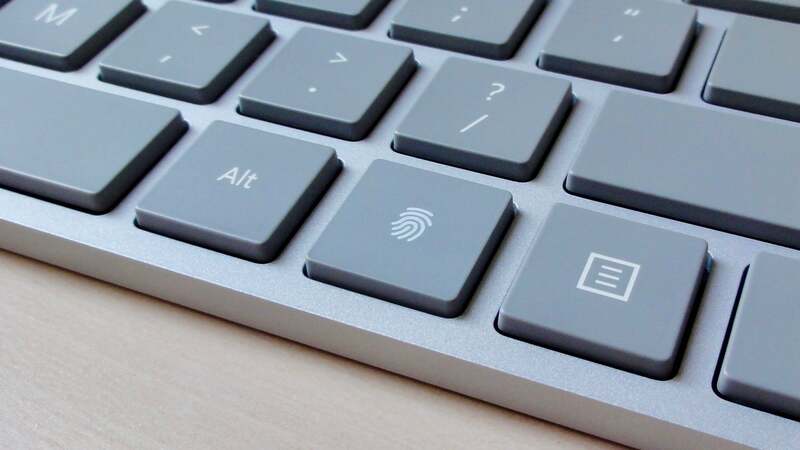 The headline feature of the Microsoft Modern Keyboard is its fingerprint scanner, which sits just next to the right-side Alt key and looks like any other key, save for the fingerprint icon. The Modern Keyboard’s inconspicuous scanner works seamlessly with Windows Hello, Microsoft’s biometric sign-in feature that lets you log into your PC using facial recognition or, in this case, a fingerprint scanner. After you've connected the keyboard to your PC, just visit the Sign-in Options screen in Windows 10, then start adding fingerprints by repeatedly holding your finger on the scanner key. Once that’s done, you can sign in to Windows 10 by pressing your finger on the key. The Microsoft Modern Keyboard's fingerprint scanner lets you log into Windows 10 at the touch of a key. I logged into Windows exclusively using the Modern Keyboard’s fingerprint scanner during my testing, and it missed only a couple of times in dozens of tries. That said, I generally had to wait a second and a half or so before my fingerprint granted me access to my PC. Overall, I'm a big fan of the Microsoft Modern Keyboard, what with its striking design, responsive keys and integrated fingerprint scanner. That said, prepare to pay up for the convenience of signing in to Windows with a tap of the keyboard, and you'd have to settle for the lack of programmable keys, too.